Oh my God, it’s over! I DID IT! 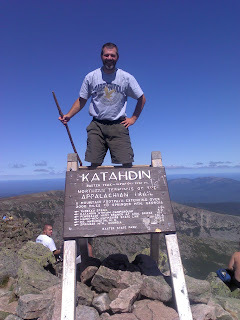 I finished the trail and took to the summit of Mt. Katahdin on September 1st at around 12:30 pm. It’s just surreal. With almost six months on the trail, I still can’t believe I finally made it to the finish line. I feel as though I’ve been born again. "It’s so remote you’ll go days without seeing anyone unless you’re in the hiker bubble." "The roads are only used by the logging trucks. Don’t bet on being able to get out of the wilderness in a hurry." These were some of the warnings given to us hikers before heading out into the 100 Mile Wilderness from Monson, Maine. On the first day, I ran into about a dozen people who drove in just to go swimming at the top of Little Wilson Falls. One kid on vacation with his girlfriend had no idea that the Appalachian Trail even existed and couldn’t fathom the idea of hiking for over 2000 miles. While he was trying to process all that I was trying to figure out where all these people came from. It was like a bus pulled up with a bunch of tourists from New York City. My plan at this point was to keep going north deeper into the desolate wild. On the next day, at some 30 miles into the wilderness, I made camp near the Katahdin Iron Works Road where there happened to be several other campers spread out in the area. 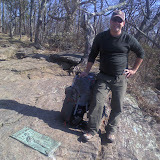 Only a few of the campers were thru-hikers like me, one was my friend Amy. The other two guys were young students in a hurry to finish the trail before school started again. They had started hiking the trail in Georgia only three months earlier. Three months, let’s see… that means they were averaging about 22 miles a day, even in the Whites and southern Maine. I would have hurt myself at that pace. Anyway, the camp area had at least six other tents with folks who happen to be in the area to tour the Gulf Hagas, a narrow gorge with several waterfalls. So again I was left wondering when the wilderness will become "more remote." Finally on the third day, there was silence from all crowds. The only sounds I could hear was from the birds singing in the warm summer air, frogs bellowing in the swamps, the occasional bee buzzing by… and the damn rattling of an empty logging truck gunning down the road in a hurry to fill his flat bed. Aside from not having a town to pull into to resupply, this first 50 or so miles in the wilderness seemed anything but remote. It was later that day however that I discovered what was finally inevitable with warm dry weather… dehydration. In the last few days there was no rain and the heat kicked it up into high gear. I never thought Maine could feel like Florida, but it did. Dehydration was really painful; it was almost like having my kidneys kicked-in by an over active soccer mom. I found myself unable to move a few times. After several breaks and some emergency water sourcing (my apologies to the frog that was ousted from his pool) I had regained my strength to keep going. My only recourse was having Amy around while I succumbed to the true meaning behind "remote." She had to get me water once when I couldn’t move. Thankfully the trail was providing the water when I needed it. Sometimes we hear the saying, "The trail will provide." And it does. I spent three days dealing with dehydration on and off because it was just THAT hot. I sweat… A LOT. There’s nothing like carrying my bodily fluids on the OUTSIDE in all my clothing while I hike. My choice of hiking apparel usually consists of quick drying material, but I think that is understood to be true while I’m NOT wearing them. Yes, I sweat THAT bad. Once I got over the half way point the rest of the wilderness wasn’t too bad, other than the previously mentioned heat and humidity. Getting into Abol Bridge just means that the end of the trail was that much closer. I’ve been secretly praying for the end to come, but when it was almost over, I didn’t want it to be. Maine has been one of the most beautiful states I visited on the trail. Hiking Maine as the last state on the trail was like having it for dessert. Four words: Toughest Trail Climb Ever! At first it seemed too easy on the going up the first couple miles. After I started hitting the big boulders I began to slow WAY down. There were rocks that had no foot holds and nothing to grab on to. Some spots seemed to beg for a misstep so that the mountain could claim another life. It was definitely the most technical of all the climbs I’ve ever done. Only Mahoosuc Notch came close in difficulty. Once I got to the top all the other thru-hikers who had made the climb were there to help in cheering me on to the finish. I’ll admit it. I got very emotional. I’ve made this dream a reality. The day was as beautiful as any I can remember. The weather was better than I could have ever asked for. There were very few clouds, it had cooled down considerably and the humidity subsided. It was a fitting end to the journey of a lifetime. The only problem with hiking to the top of a mountain is that you must then hike down The trail I had just been on was really tough going up and probably would have scared the crap out of me going back down. So I decided that if I must be scared then I should take the alternate route down called the Knife’s Edge. It’s a hairy ridge walk where there is sometimes little more than a foot of trail to walk on overlooking a very steep drop down the mountain (see the photos). It was a religious experience. "Oh my God, oh my God, oh my God… don’t look down!" Most hikers coming off the trail have little to do. Some go hiking again. Some go to work to make enough money to go hiking again. Some go back to school like me. Others just sit, get bored and depressed while they gain all the weight they had lost on the trail. Not me. I’ll be finishing up school this semester which includes my thesis, my last class, and job hunting. I’ve pondered the idea of writing a book, maybe just for the information in my study and for what I’ve learned. Maybe it’ll include more stories of the trail as I have experienced them, as well as others. I’ll have a new career that will require my devotion. And I will have dreams of traveling that will go beyond work and school. Regardless I’ll be busy and will not have time to become the depressed hiker. While I love to plan, my plan for life right now is to live this moment, remembering the good times on the trail and being aware of other worlds out there. There’s another way of life that I got to experience for six months. For that I’m grateful. Now I need to get my bike cleaned up and get my cycling legs back. I think I might do a cross country ride.